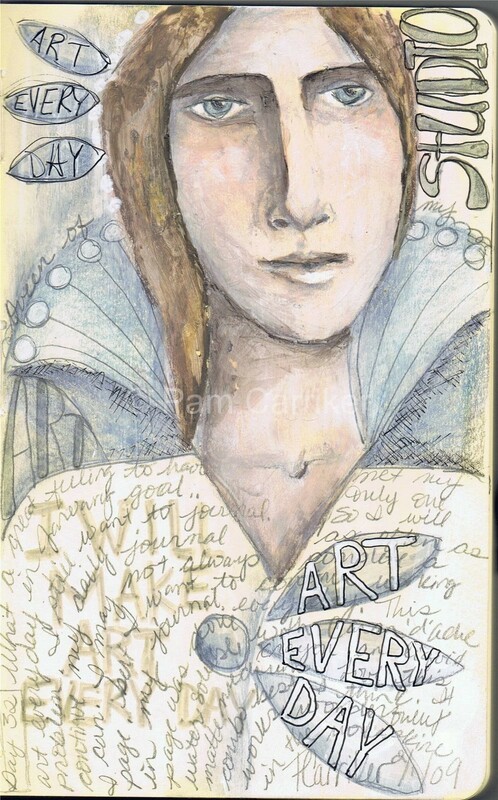 What can I say, if you do something for 31 days in a row you develop a habit:-) I used Golden’s liquid matte medium with Caran d’ache water soluble crayons in my Moleskine journal. The pages hold up really well to this method. My Art Journalism 101 class is in it’s 4th week and we have an amazing 105 students! Everyone’s pages are looking wonderful. Class registration is closed, but I will be offering it again in the future. I am working on a Shades of Grey class, that will be featuring Pitt Pens. I’ve had so many asking about it that I decided to take that on for my next workshop. I will keep you posted as to dates and registration etc. « Day 31, I did it!!! Hi Pam,I have only used the neo colors with water. Any trick to using the mat medium? How do you do that? Congrats on your HUGE accomplishment!! Each and everyone one of your pieces are perfect studies for larger works or stand up enough on their own. I think I completed 3 journal pages in a whole month..lol. This is just not something I can commit to everyday. I have no idea how you do it! Stunning…I especially love the collar around her neck, almost Elizabethan.